When the name of the author of a book is larger than the title of a book, you know the author has become a public entity. Dan Brown, the author of the tear away best seller The Da Vinci Code, is now in that category. 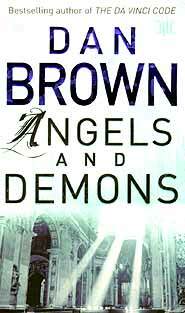 Angels and Demons was first published in 2000, and in soft-cover in 2001 and once more recently (ISBN 0-671-02736-0), and inevitably, comparisons have to be made between the two books. Both are thrillers, both feature Harvard professor Robert Langdon, and both start with a ritualized murder. In fact completing the similarity, Langdon’s ‘partner in crime’ is also a young lady who was related to the deceased, met briefly in the first few pages. However, in The Da Vinci Code it was a fanatical sect of the Catholic Church that was wreaking havoc in its bid to keep Mother Church intact. In Angels and Demons it is a fanatical sect which is out to destroy the Catholic Church instead, called the Illuminati. Having been amazed with Brown’s attention to detail in The Da Vinci Code, I began reading this book in front of the computer screen, locked on to Google to check the multitude of details Brown throws into his plots. When he produces an organization, based in Switzerland, that is supposed to have invented the world wide web, I was sure I had discovered a weakness in his research, or a deliberate attempt to delude the reader. I have to apologize to Mr. Brown, he was correct! He is also correct with his references to the Illuminati, the connection to the Masonic Lodges and the symbols on the American banknotes! Most of the book is set in Vatican City, and architectural markers abound, lending credibility to the plot, which in true Dan Brown fashion races along at breakneck speed to the contorted denouement. What must not be forgotten is that these are thrillers to entertain the reader. Whilst Brown does educate to some degree, these are not text books, which some reviewers have allowed themselves to believe. Angels and Demons is not a textbook, it is just a very clever work of fiction and is actually the prequel to The Da Vinci Code. At B. 350 for the paperback it is a great read. The hardcover imprint with photographic plates at B. 1250 is still a great read, but it is still not a ‘real’ textbook! A tour of Britain’s smaller halls was lined up and the band gigged everywhere that people wanted to see them, adding Terry Steers on rhythm guitar to fill out the live sound. Terry was also great at rabble rousing the crowd as John and Mick showed off at the front. Then, once again, the world caved in on the boys. First they went out on nationwide tour with Uriah Heep on their Conquest tour, by which time all of the members of Uriah Heep hated each other and the tour had to be terminated mid tour due to the impossibility of getting the headliners on stage all at the same time. Dreadful revues didn’t help either. A Sounds Magazine headline read “The Agony & The Ecstasy” with a picture of Uriah Heep’s lead guitarist under agony and Mick Devonport under Ecstasy. The review went on to say the tour roles should be reversed and Rage should headline. This did not exactly help band relations on the tour bus. With the tour finished and Carrera Records in financial trouble, Rage were bundled back into the studio for another album, something with a cover that they could sell. But after the experiences of the previous few months the boys weren’t ready and, quite honestly, the resulting album “Run For The Hills” is patchy at best. Carrera Records then collapsed in a financial heap. This really was the end for “Nutz / Rage”, as younger bands were coming through. No matter how talented they were, their day was over. What is a travesty is that none of this marvelous music is presently available to the public. There must be a market for this music. Mick, David, Keith, Kenny, and Terry, wherever you are, thanks for the memories. John Mylett was tragically killed in a motorcar accident in Spain two weeks after “Rage” were put to rest. John was so convinced that one day his band would make it, he had previously turned down the drum seat in Iron Maiden. The band as an epitaph recorded: “So You Want To Be A Rock ‘n’ Roll Star”, under the name of “Spitfire” as they were convinced that certain elements of the press had it in for them. They tried to have a hit under the name of Spitfire … Silly Fokkers. Later, the remaining members of Rage gigged around the Liverpool scene with David Lloyd forming a band with Steve Morris called Sliced Bread. Steve Morris turns up again in Garth Rocket and the Moonshiners, which had a certain Ian Gillan on lead vocals and Keith Mullholland on bass. Keith Mullholland plays to this day with Mick Davenport in covers band the Space Cadets. The Nutz/Rage story is one of a great band, great days, and a great shame they never became stars.